Fun-filled drama classes for children aged 4-16 years of any ability. Friendly atmosphere focusing on building confidence and developing performance skills, including music and dance. Big Red Curtain is a local independent performing arts school and casting agency, our stage school has over 20years of industry experience and specialises in high quality tuition of music, drama and dance for 6 to 18 year olds. All abilities of students are welcomed and nurtured with no audition to join. Performing is highly valued at Cre8 Drama, with students working towards at least three public performances a year at local theatres. Classes are taught by experienced professionals who are fully CRBd and insured. Wednesday (in term time)., 5.30-7.00 pm. The school prides itself on professional standards and high quality teaching in a friendly and welcoming environment. Offering a range of classes including: Ballet, Tap, Modern Jazz, Freestyle, Street Dance for boys and Tiny Tots an introductory class for pre school children from age 2. IDTA examination sessions are held at least twice a year and an Annual Showcase is held every July. A drama session including lots of fun, drama, games and play with the chance to put on mini productions. Suitable for ages 5-8 years. First session free. The Helen O’Grady programme is a unique, developmental drama programme, which creatively develops language, communication, confidence and self-esteem. No auditions required and no experience necessary. 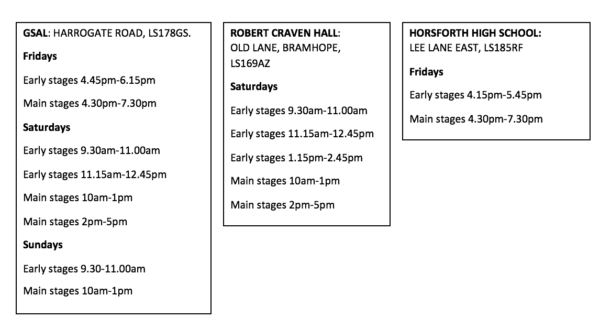 Classes in Roundhay, Cookridge, Headingley and Farsley. A brand new and creative approach to the theatre. Explore all the theatre can offer from the acting, music, stage design and props. A class where children aged 5-11 can experience many forms of expression and find their own creativity and really be a part of the whole process. There’s something to excite every young mind. A Children’s Theatre Group based in Boston Spa. This is not a drama school, but a fun based Theatre Group who perform two shows per year. We play lots of confidence building games, put together role plays, and as show-time approaches we work really hard on our pieces. Razzamataz Theatre School provide affordable, performing arts training for children and young people. Using theatre arts within small class sizes to nurture a child’s confidence and self-esteem, all the time making sure every student has a lot of fun whilst they are learning new skills and making new friends. Main Stages (6-18 years) where young people learn new skills in each of the complementary Musical Theatre disciplines of singing, dancing & drama. Main Stages (6-18 years) where young people learn new skills in each of the complementary Musical Theatre disciplines of singing, dancing & drama. Nurture the shy and apprehensive, until they find their feet and voice, whilst at the same time developing and channelling those with bundles of talent, confidence and energy. 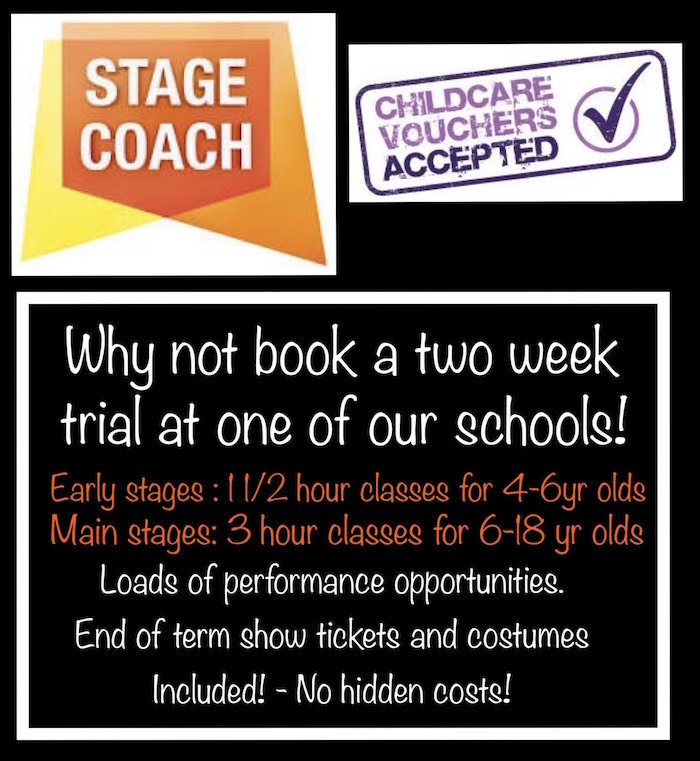 Stagecoach Wetherby provides high quality part time training in the performing arts for children aged 4 to 18. We nurture and develop potential through singing, acting and dance classes, encouraging creativity and developing confidence, physical awareness, communication and articulation – while being educational and fun. TLA is the professional training platform to performing arts in the North. Classes in Drama, Dance, Singing and Music are the key factors to what makes the school so incredibly popular amongst casting directors, visiting TV and Theatre directors and established tutors.